Dr. B: Is this Victoria? Dr. B: Have I caught you at a bad time? Dr. B: Ok. Well, I told you I would call you with your biopsy results. Dr. B: It is not invasive cancer, which is good. However, you do have sort of like "pre-cancer" cells. ME: Is this what you would call DCIS? [DCIS = Ductal Carcinoma in Situ - a non-invasive form of cancer contained in the milk ducts]. Dr. B: Yes. That is what it is. ME: Ok. I had that extensively on my other side, along with an invasive tumor. So, I know what that is. Dr. B: I am at home right now and don't have your file. How long ago was that? Dr. B: Ok. I will give your Oncologist a call tomorrow, and will look at your history a little more closely. Then, we will determine what to do next. ME: Ok. That sounds fine. Dr. B: You might be okay with just a lumpectomy, but I will know more after discussing with your Oncologist. But, we don't want to wait around too long on this, as it has a potential to change quickly. Dr. B: Ok, then. I will talk to you soon. ME: Thank you for your call. We hung up the phone and David gave me a hug. We were not surprised by the news, but it was not what we were hoping for either. At least, there isn't any invasive cancer, so we are very grateful for that. Unfortunately, I will be facing another surgery, and I am not worried or scared about it; but, to be honest, I just don't want to go through this again! Surgery is painful, and inconveniencing, especially during this time of year. But . . . if that is the best option, then I will accept it. And, I will continue to TRUST in a loving God who will be with me through it all. 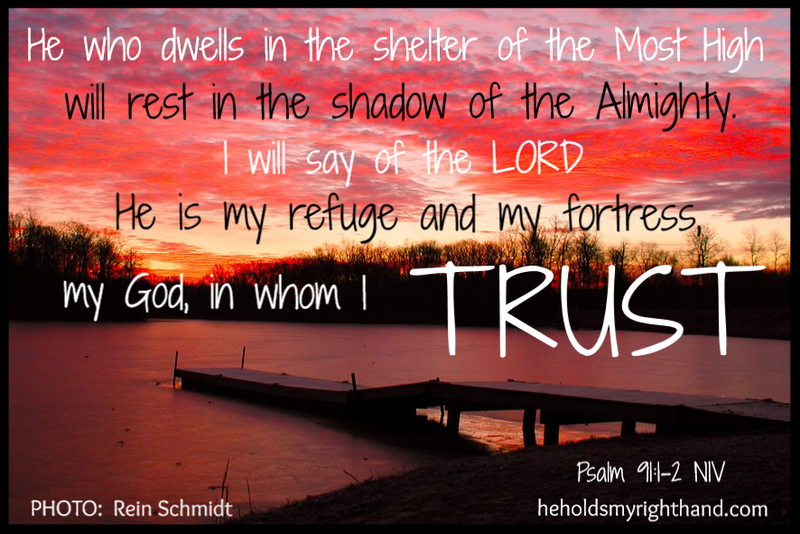 He is my refuge and my strength. I now have a consultation scheduled with my Oncologist for December 11th. We will know more about my case at that appointment. Hang in there. I wish the news was better, but it is encouraging that it isn't worse. God will hold your hand through this. TRUST #45: Cancer "Processing Mode"